Vehicles abandoned on City streets for longer than 72 hours can be reported to the Chandler Police Department non-emergency number. Abandoned vehicles on private property can be reported to Code Enforcement. Residents can make a voluntarily donation to assist needy individuals and families through the Acts of Kindness program. Contributions are distributed through a grant process to nonprofits who provide vital services for Chandler residents. Leagues for adult sports are offered three seasons a year: winter, spring and fall. The leagues include men’s softball, co-rec softball, men’s basketball, men’s flag football and co-rec volleyball. It takes action and commitment by all of us to make our air cleaner by controlling the particulate matter that gets into our air. Report serious offenders to the Maricopa County Air Quality Department. Chandler Municipal Airport is owned and operated by the City of Chandler. All businesses and residences with an alarm system must obtain a permit from the Chandler Police Department. The Maricopa County Animal Care and Control Department is responsible for rabies and Animal Control functions in the county. The City of Chandler is responsible for picking up dead animals in City right-of-way areas only. Chandler's aquatic centers and pools offer a variety of swim lessons, water safety classes and fitness programs. Arizona 2-1-1 is a private, nonprofit community information and referral service that connects people with health and human services in Arizona. Arizona law requires anyone who plans to dig for any reason to contact Arizona 811 at least two full working days in advance to have all underground utilities in the area located and marked. Arizona 811 works with excavators and homeowners to facilitate pre-excavation notification services. Arizona Relay Service makes communication by telephone easy and accessible for people who are deaf, deaf and blind, hard of hearing or have difficulty speaking. The Lawyer Referral Service provided by the Maricopa County Bar Association helps match clients with attorneys that suit their needs. The City of Chandler uses online and live auction services for the sale of surplus items, including vehicles, unclaimed police evidence, computers, office materials and building equipment. Be cautious with bee swarms. Do not try to remove bees yourself, and do not call 9-1-1 unless the bees are attacking and someone is in a life-threatening situation. Contact (web search) a bee removal expert for swarm and hive removal or relocation. Property owners are responsible for pest control on their private property. However, the City of Chandler does provide for the removal of bees if they are inside City water meter boxes. Bees are highly valuable creatures and there are many bee specialists who will provides live, humane bee removal & relocation instead of extermination. Search on Google or another web browser for Humane Bee Removal and Relocation specialists in the Chandler area. All bicycles must be registered online or at the Police Department Main Station, located at 250 E. Chicago St.
Bike and scooter sharing companies are privately owned and operated and are not affiliated with the City. If you have a concern about where a bike or scooter is parked, please contact the bike or scooter share company directly. If you get no response, please contact Jason Crampton with the City of Chandler Transportation Policy Division at 480-782-3402. Chandler’s utility billing system makes it easy to manage your account, access your information, and pay your bill via the method that is most convenient for you. Holding a Block Party on your street is a great way to energize the neighborhood, have fun and make new friends. Citizen volunteers advise the City Council on a broad range of topics. Applications for these positions are available through the City Clerk's Office. The Development Services Department reviews and issues permits for all development projects. The City offers electronic plan review for all projects. Residents paying for city-provided solid waste services can schedule a free curbside recycling and/or trash bulk collection every six weeks. Valley Metro operates bus service 365 days a year, with an extensive list of regional and local routes traveling through Chandler. A business registration is a certificate issued to a business for each physical location operating within the City limits. All Chandler businesses are required to complete a Business Registration Application and obtain a business registration for each location within the City limits. 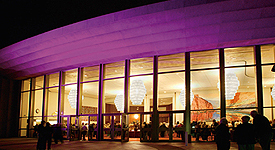 Chandler Center for the Arts makes visual and performing arts available to the entire community by hosting a variety of events, exhibits and performances. The Chandler Chamber provides programs and services that support business and the Chandler community. The City's government access cable station televises City Council meetings and study sessions, Planning and Zoning Commission meetings, locally produced shows about the community, promotional videos and information bulletins. Chandler's municipal complex offers convenient access to the most used City services and serves as a source of pride for residents. Chandler Regional Medical Center has been serving the health and well-being of our community since 1961. The Chandler Unified School District is a premier school district of choice, serving students in grades K-12 in Chandler and surrounding communities. Legal advisor to the Mayor, City Council, City Manager and City boards and commissions. Prepares proposed City ordinances and other legal documents and represents the City in legal matters. A compilation of articles and ordinances establish the rules and regulations under which the City of Chandler operates. Questions about the City Code? The City Clerk's office offers a range of services to the residents of Chandler, including processing passport applications, notary services, municipal elections and records regarding City Code and City Council actions. The Chandler City Council is comprised of a mayor and six councilmembers elected at large on a nonpartisan ballot. It meets in the Council Chambers at 88 E. Chicago St. on the second and fourth Thursday of the month. Should you wish to address the City Council on an issue not on the agenda, please contact the City Clerk's Office. To vote in a City election, you must be a citizen and registered to vote at your Chandler address. The Maricopa County Recorder's Office outlines the requirements for voters to register or update their voter registration. Under the policy direction of the City Council, the City Manager and staff put City Council policies into practice and are responsible for the efficient day-to-day operations of the City. The City Prosecutor is responsible for the prosecution of criminal misdemeanor cases in City Court and handles appeals to the Superior Court, Court of Appeals and State Supreme Court. Code Enforcement keeps neighborhoods and commercial properties free from unsightly or hazardous conditions that are blighting and lead to further deterioration in our community. The Community Center houses a large multi-purpose room capable of seating 500 people, a stage, eight rooms for classes and meetings, plus offices for the Community Services Department. A Senior Center is part of this complex and offers a full schedule of activities and services for senior citizens. Chandler Municipal Court promptly and fairly process all criminal and traffic violations, facilitate mediation of neighborhood disputes and issue Harassment Injunctions and Orders of Protection. Some Cardiopulmonary Resuscitation (CPR) certification courses are available through the Chandler Recreation Division. If you can't become CPR certified, please learn how to give Hands-Only CPR. If you see a teen or adult suddenly collapse, call 911 and push hard and fast in the center of the chest to the beat of any tune that is 100 to 120 beats per minute (for example, Staying Alive by the Bee Gees). Immediate CPR can double or even triple a person's chance of survival. The Chandler Police Department has crime prevention officers highly trained in all areas of crime prevention. They assist businesses and residents with preventing crime and help communities establish neighborhood watch programs. The Desert Breeze Railroad and antique carousel is located at Desert Breeze Park. Dial-a-Ride services offered by Valley Metro provide transportation to senior citizens and people with a disability. Reuse is a kind way to recycle. Donating items rather than throwing them away can support local charity efforts to sustain job training and self-sufficiency programs for people with disabilities and families in need. The Downtown Chandler Community Partnership is a nonprofit corporation whose mission is to advance Downtown Chandler as a regional destination. Downtown Chandler offers an urban environment that is pedestrian friendly with architecture and character that is unique. Strategically-placed parking structures, pedestrian walkways, striking historically-inspired architecture and new uses that complement the community and marketplace. For decades, smart management decisions have helped Chandler to maintain a steady water supply. Chandler began preparing for naturally occurring droughts decades ago and started its water conservation programs in 1990. 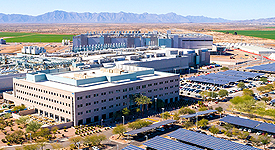 Chandler’s Economic Development Division promotes the city as a preferred location for new and expanding businesses and enhances employment opportunities through support to the business and commercial real estate community. City Council elections are held in the even numbered years. Each election year, 3 positions for the City Council are up for election. Every four years an election is held for the office of Mayor. The term of the office of Mayor and Councilmember is four years and is limited to two consecutive terms. The City of Chandler provides information and links to resources that prepare residents in the event of some type of emergency or disaster situation. The Environmental Education Center serves as a gateway to Veterans Oasis Park, a 113-acre Sonoran Desert landscape, and offers a variety of programs, classes and events for all ages. Environmental Management provides environmental compliance guidance and oversight to City operations and facilities. A community resource offered by the City's Housing & Redevelopment Office. Located in Dr. A.J. Chandler Park in Downtown Chandler, the Farmers Market is held on Saturdays (November through May) from 8:30 a.m. to 12:30 p.m. and offers a variety of fresh produce and other items. It is hosted by the Downtown Chandler Community Partnership (DCCP). A listing of fees associated with City permits, licenses, programs and services. Public notice of proposed fees that may be considered by Chandler City Council is provided on the City's website, as outlined by Arizona State Statutes. Accurate financial records and information is provided to the public, bondholders, grantors, auditors, City Council and City management. The Fire Department is responsible for the suppression and prevention of fires, emergency medical service, control of hazardous materials, enforcement of fire codes and regulations, building inspections and fire investigations. The Maricopa County Air Quality Department provides information on air quality forecasts, no burn day restrictions and ways to reduce air pollution. Chandler has installed flashing yellow left turn signals at intersections to improve traffic flow. AZCEND, located at 345 S. California Street, in Downtown Chandler distributes food boxes to families and individuals in need. Organizations meeting the City’s criteria may apply for “pass through” grants that require City Council approval through resolution. Once approval is attained from the City, it is the responsibility of the organization to submit all documentation to the Gila River Indian Community. Recycling and trash containers are collected weekly. To ensure collection service is not interrupted, have your container at the curb by 6 a.m. on your day of collection, or after 6 p.m. the evening before your collection day. Remove your container from the curb no later than 9 a.m. the day after collection. Information regarding property owned by the City of Chandler, but leased for commercial, residential rental, or industrial purposes. Located on the north end of Hamilton High School, 3700 S. Arizona Avenue. Health Connect is a three-pronged approach to promote overall Financial, Physical and Mental health and well-being in the community. Links to a number of community, education, government, health, social services, utilities and Veterans resources. Many City of Chandler offices and facilities are closed on major holidays. However, emergency services (Police & Fire) are provided every day of the year. Throwing household chemicals in your trash container, pouring them down the drain or dumping them at the curb is dangerous and irresponsible. To better serve Chandler residents, household hazardous waste collection is offered at the City's Household Hazardous Waste Collection Facility. This office administers public housing projects and funding for federally subsidized housing programs. Payments for subsidized housing can be made at the cashier counter inside Chandler City Hall. The Arizona Humane Society offers a variety of programs and services for animals and pet owners as the state's largest animal welfare organization. Water can be purchased from the City through a hydrant by requesting a hydrant meter. To report an open or broken hydrant or obtain information on flow tests call the City's Water Distribution staff. Chandler's Industrial Pretreatment Section is responsible for enforcing all Federal, State, and Local pretreatment regulations authorized by the Clean Water Act. This includes monitoring and inspection of all significant industrial users and inspecting oil and grease interceptors at all commercial facilities within the City. InfoMap is an interactive map that links to information about existing or planned facilities the City believes may be of particular interest to the public. Careers at the City of Chandler. A KNOX-BOX® Rapid Entry System gives emergency access to public safety agencies. A Knox-Box is required when a structure's Fire Sprinkler Riser Control and/or a Fire Alarm System are located inside the building. To obtain a Knox-Box, order online (enter “Chandler” under City). Kyrene School District serves preschool, elementary and middle school students in parts of Chandler and surrounding communities. To promote water conservation inside and outside our homes, rebates are offered to residents with active City of Chandler utility accounts who install low water use landscaping (Xeriscape) and automatic irrigation controls. To promote mutual respect and inclusion in Chandler. We work toward the elimination of prejudice and discrimination among all citizens within our community. 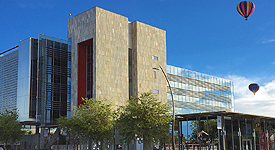 Chandler Public Library offers access to an extensive digital collection of resources and four locations to serve the community: Downtown, Basha, Hamilton and Sunset. The Intergovernmental Affairs Coordinator serves as a lobbyist and advocates the City's position on issues before the U. S. Congress and State Legislature. 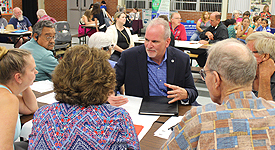 Mayor Kevin Hartke supports several initiatives to connect with community members in areas that are important to the entire City. The Mayor encourages all Chandler residents to get involved. Mesa Public Schools operates three elementary schools in Chandler, serving students in grades K-6. Connecting with the City of Chandler is as easy as a click on your smartphone! The City has launched free mobile phone applications that allow residents with smartphones to communicate directly with staff to resolve issues in the City and your neighborhood. The best way for residents to protect themselves from mosquito-borne illness is to reduce the number of mosquitoes around the home and take personal precautions to avoid mosquito bites. Driver License testing, vehicle registration and licensing is available at the Motor Vehicle Division, located at 50 S. Beck Avenue in west Chandler. Vehicle Emissions testing is available at the Arizona Department of Environmental Quality testing stations, located at 20 N. Beck Avenue in west Chandler and 2360 S. Airport Blvd by the Chandler Municipal Airport. Chandler's municipal complex offers convenient access to the most used City services and serves as a source of pride for the residents of this great community. The Chandler Museum is under construction and will open in December 2018 to provide a cultural destination with engaging community-focused programs and forums. The goal of Code Enforcement is to keep neighborhoods and commercial properties free from unsightly or hazardous conditions that are blighting and lead to further deterioration in our community. Neighborhood Programs strengthens Chandler's neighborhoods through partnerships, programs and services. Proposed fees are posted 60 days prior to consideration at a City Council public meeting, to allow time for citizen comment. Chandler’s online utility billing system makes it easy to manage your account, access your information and pay your bill. The City of Chandler recognizes and appreciates the dedication and service of the military members in our community. Operation Welcome Home Chandler formally honors military men and women who have served our country upon their return from active duty. The Chandler Chamber of Commerce produces the Ostrich Festival each March. Find out about more than 60 parks in our community; from the largest regional parks to community parks, neighborhood parks and special use facilities. Controlling the particulate matter takes action and commitment by all of us to make our air cleaner. Particulate matter 10 microns or less in size (PM-10) is known to contribute to and aggravate respiratory illnesses. The Department of State has designated the Chandler City Clerk’s Office as a Passport Acceptance Facility. The City Clerk's Office is located on the first floor of Chandler City Hall at 175 S Arizona Ave. Passport processing is available Monday through Friday from 8 a.m. to 3 p.m.
Pets can be a rewarding addition to any family, but they come with responsibilities. Courtesy and respect are part of being a good neighbor and also a necessity when it comes to pet ownership. City Planners strive to promote the community's development with a high quality of life through professional planning strategies, collaboration with members of the community and serving as the liaison to the Commissions and Boards appointed by the Mayor and Council. Before you drain water from your pool, make sure that you are meeting the City's pool draining requirements and read our frequently asked questions. Chandler residents who own a swimming pool must comply with the City's pool fencing requirements. Read answers to frequently asked questions for details about pool fencing. Chandler offers four aquatic centers and two pools that provide swimming lessons, fitness programs and recreational swimming. Records are considered public records, unless protected by law, and may be viewed and/or reproduced as permitted by law. Public records are maintained in various locations and some records may contain private or sensitive information that requires additional review and possible redaction. Recreation classes, activities and special events produced by the Community Services Department are published in the quarterly Break Time magazine. Need information about City-provided recycling and trash service? Customer Service Representatives are available Monday - Friday from 8 a.m. to 5 p.m. at 480-782-3510 to answer questions about our programs or schedule services for recycling and trash collection. We have an extensive roach control program that involves a special paint on sewer manholes that effectively controls roaches in our sanitary sewer system. Many roaches originate on private property and sealing cracks and crevices around your home is a good way to rid your property of roaches. Chandler's Tax and License Division administers and issues special regulatory licenses. We work with the Arizona Department of Revenue on the centralized licensing, reporting and collecting of transaction privilege (sales) and use taxes. Section 8 Housing is the federal government's major program for assisting very low-income families, the elderly and the disabled to afford decent, safe and sanitary housing in the private market. Since housing assistance is provided on behalf of the family or individual, participants are able to find their own housing, including single-family homes, townhouses and apartments. Chandler offers a variety of activities, classes and programs for residents of all ages, at multiple recreation facilities throughout the City. Visit the Chandler Senior Center and check out upcoming classes for senior adults in the latest Break Time magazine. The Maricopa County Sheriff's Office provides law enforcement services to unincorporated areas of Maricopa County. The Sheriff's Office jail system also is used by the Chandler Police Department to house inmates. Report stray shopping carts to Arizona Cart Services via their online form or at 1-800-THE-CART. They work with most major grocery and retail stores for cart retrieval. Slurry seal reinforces and prolongs the life of older roads. Slurry is made up of pieces of fine gravel combined with emulsified asphalt and water that is applied to older surfaces as a pavement preservation mechanism. The Streets Division constantly monitors the condition of streets in the City and performs inspections to decide if a slurry seal is necessary on existing roadways. Chandler hosts special events throughout the year that make our community a great place to live, visit and play! The Adult Sports program offers great opportunities for adults to get exercise, have fun with family and friends and meet new people. Leagues in men’s softball, co-rec softball, men’s basketball, men’s flag football and co-rec volleyball are offered three seasons a year: winter, spring and fall. The STAR Community Rating System is the nation’s first framework and certification program for local sustainability. STAR stands for Sustainability Tools for Assessing and Rating communities. The City of Chandler was in the first group of communities nationwide to receive a sustainability rating. Stormwater is runoff and surface flows generated from rainfall. When it rains, the storm drain system moves rainfall along city streets and gutters into storm drains constructed along the street, and eventually deposits the rain into retention basins, greenbelt areas, parks and lakes within the community. If you are experiencing problems with cats roaming on your property, the City recommends talking to the pet owner first in order to resolve the problem. If speaking with the pet owner does not resolve the situation, there are several deterrents you can try to discourage cats from entering your yard. The City of Chandler maintains more than 24,000 street lights along its major streets and neighborhoods. Is there a street light out in your neighborhood? Tell us where, and we'll make the repair. Street light repairs in private gated communities are handled by the homeowners association. The City is required by State Statute to submit a report each year that documents the annual System Development Fees. A certified audit of land use assumptions, the infrastructure improvements plan and system development fees is conducted every two years. Chandler teens can get involved in their community through the Mayor's Youth Commission and gain work experience through the Leaders in Training program. The Chandler Municipal Court provides a description of your options if you receive a civil traffic complaint and the steps involved in the various Court processes. Chandler’s utility billing system makes it easy to manage your account, access your information and pay your bill via the method that is most convenient for you. Rates for water, wastewater, reclaimed water and solid waste for Chandler utility customers. Chandler taxpayers can be assured that their community continues to have some of the lowest cost of services, utility charges, sales tax rates and staffing levels in the Valley of the Sun. The City of Chandler uses the State of Arizona's Vendor Registration System. Once registered, vendors will be notified of bid and proposal opportunities in the commodity or service categories they have registered under. The City partners with the Department of Veterans Services to assist in communicating with veterans about the benefits in which they are entitled. The Volunteer Income Tax Assistance (VITA) program provides free tax preparation to low- and moderate-income taxpayers, the elderly and those with disabilities. The City of Chandler provides opportunities for those interested to enhance services provided by the City to the community, to learn new skills and to use their talents while helping others. Arizona voter registration information is available through the Maricopa County Recorder's Office. The City offers a number of free resources, informational materials and programs to help its residents conserve water for future use. To promote water conservation inside and outside our homes, the City of Chandler offers rebates to residents who install low water use landscaping (Xeriscape) and automatic irrigation controls. The Public Works & Utilities Department plans, develops, constructs and maintains water, wastewater and solid waste infrastructure and services for the City of Chandler. Each day, the City of Chandler Water Quality Specialists perform up to 100 tests on the drinking water you receive at your home or business. These tests ensure that your water meets every health and safety standard set by the state and federal government. A WeatherCam on top of Chandler City Hall gives residents a glimpse of what is on the horizon.